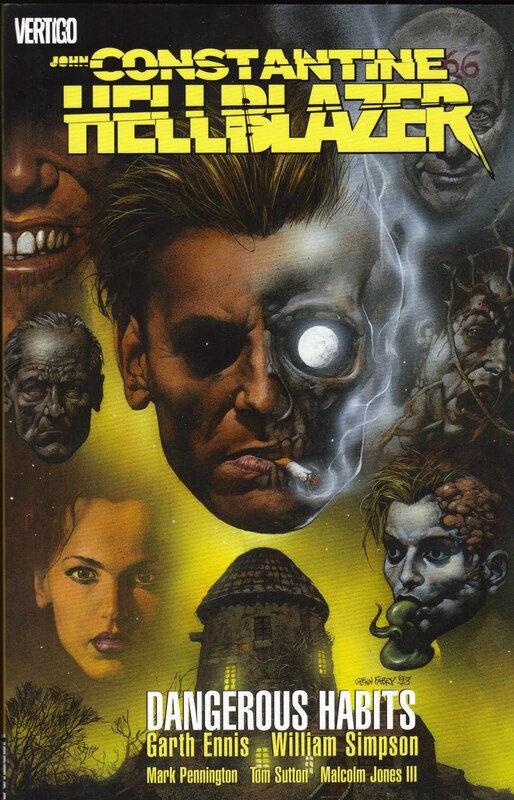 What with the announcement that they're doing a Constantine TV show pilot, I wanted to talk a little bit about "Dangerous Habits," one of the comic book series' best storylines. Supposedly the TV version of Constantine won't feature him smoking, so this particular storyline would need some fairly major changes if they were going to try and incorporate it at some point (which I assume they would). John Constantine is a magician of the streets of London, who is as much a confidence man as he is actual blue-collar magician. He's known for being mostly self-serving and of having a nasty problem of most of his friends getting caught up in the crossfire of his life. A lot of people describe him as an antihero, but I've always preferred to think of Constantine as the Raymond Chandler version of a sorcerer, sort of the hard-nosed detective turned spell slinger. Many of the best of the Hellblazer stories certainly unravel like mysteries, but they are also dark, manipulative things, and while there's almost also some element of deadly magic involved, we're often reminded that the most thing in existence is the human heart, sometimes even Constantine's own. It helps to know a little bit about Constantine as a character before the "Dangerous Habits" storyline, but it also works as a cold open for the character. My first exposure to Constantine came from "Books of Magic," Neil Gaiman's four issue mini-series that sort of gave a sightseeing tour of the more mystical parts of the DC universe, and Constantine was one of the four tour guides in that series, and I liked the character right from the start. He was smug and arrogant and just the right amount of condescending without being an utter prick.